Often times, I don’t read novellas that are part of a book series. Either I forget that they exist or I just don’t have an overall interest in them. 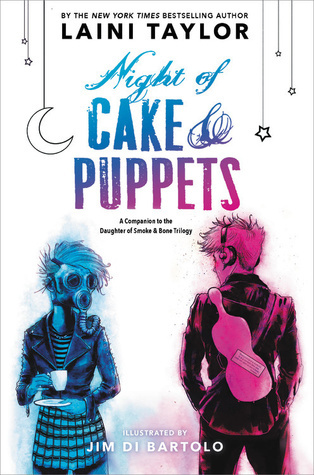 However, I knew that I wanted to read Night of Cake & Puppets. A few years ago, when I was actively reading the Daughter of Smoke & Bones series, I really wanted to read this one. In fact, I even bought the Kindle edition, since that was the only one available at the time. The problem was, I hate reading books on my Kindle, so I kept putting it off. Then finally the book was released in physical format and I had to get it. I really wanted to love this book, because I loved the main books in this series. However, as I was reading this, I kept questioning things. Who the heck was Kaz? What the heck is going on? Who/what was Kishmish? While I was enjoying the story, I wasn’t fully understanding everything. Obviously the problem lied on my end. It had been too long since I had read the series can I could no longer remember who was who or anything that had happened up to this point. So needless to say, while I liked the book, I didn’t love it. The story is a very quick read, and the illustrations scattered throughout definitely added something extra to the whole experience. I am glad that I finally read this one, even though it didn’t blow me away like I had hoped it would. I think to truly appreciate this book, I need to go back and reread the entire series, that way I will know all of the characters and events that led up to this point – which I plan to do at some point.. This entry was posted in Books, Fantasy, Romance, Young Adult and tagged Book Review, Books, Fantasy, Romance, Young Adult. Bookmark the permalink.